Jan. 6. 2015 -- Los Angeles has always been a great place to start a new life, to re-invent yourself, and leave your old life behind. Sometimes it works out. Sometimes it doesn't. And sometimes research into mysteries raises more questions than it answers. Sara Luttra Winslow was born in 1903 in Logansport, a small town on the Indiana prairie, about 70 miles north of Indianapolis and 120 miles southeast of Chicago. She was the youngest of eight children born to Elwood, a barber, and Sarah Ferguson Winslow, a laundress. Since there was already a Sarah in the household, the little girl went by her middle name. Luttra's mother was active in the local church for most of her life, singing in the church choir and taking on an assortment of other roles, and she raised her children to be involved and active in their church. Luttra's mother died when Luttra was 9, at the age of 57, and her father died less than three years later, at the age of 61, when Luttra was 12. Three years after her father's death, Luttra married Sam Lee Hill, 28, who worked as a molder in a radiator shop. In 1920, Luttra was living in Logansport with her husband and her mother-in-law, and remained there until about 1925. Little is known about the next few years of Luttra's life. Her next appearance in official documents was in 1930, when she was 27 years old, living on East 49th Place in South Los Angeles, and newly married to Charles E. Butler, 46, who was working for Central Casting. Butler, who was born in Michigan, was one of the first black casting directors in Hollywood. He worked with director King Vidor on his first sound film, the Oscar-nominated "Hallelujah" (1929), which was filmed in Memphis and featured an all-black cast. 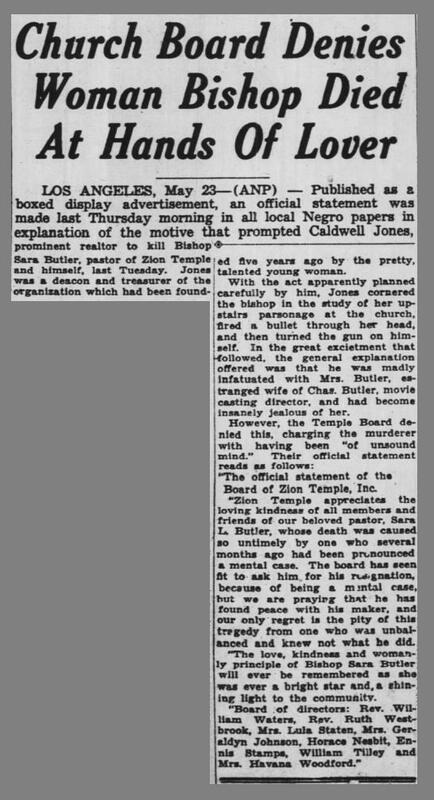 In 1933, Luttra -– who now went by Sara -– became an ordained minister, was awarded the title of bishop, and formed a church in South Los Angeles, which she called the Zion Temple Community Church, at 1315 E. Vernon Ave., just a few blocks from her home. The transformation was complete -– Luttra Winslow Hill, the teenage wife of a radiator shop worker in a small town in central Indiana, had become Bishop Sara L. Butler, founder and leader of her own church in Los Angeles. By 1940, everything appeared to be going well for Charles and Sara Butler. 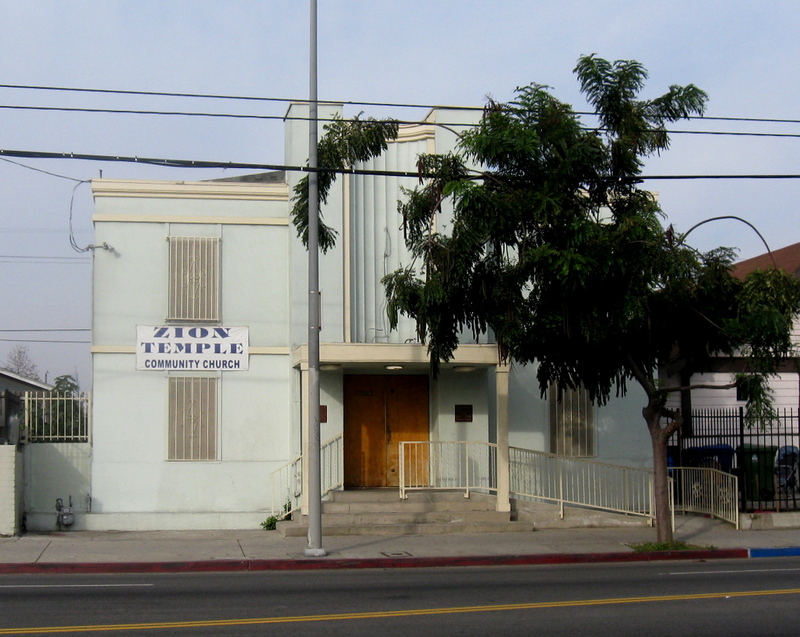 The Zion Temple Community Church had one of the fastest-growing congregations in Los Angeles, and the Butlers had moved into a new home on East 52nd Street. Bishop Sara also traveled across the country, speaking at various churches, including a stop in her hometown of Logansport, Ind. But, in fact, the Butlers had separated. Charles was living in the house on East 52nd Street, while Sara was living alone in a boarding house on East 20th Street. One of the active members of the Zion Temple Church administration was Caldwell H. Jones, a real estate broker and columnist for the California Eagle newspaper, who served as church deacon and church treasurer. Jones was born in Alabama in 1885, and married his wife, Hazel Calloway, in Chicago in 1915. Their son, Herbert, was born a year later, and the family moved to Los Angeles, where Jones worked as a shoe-shiner before establishing himself as a real estate broker. 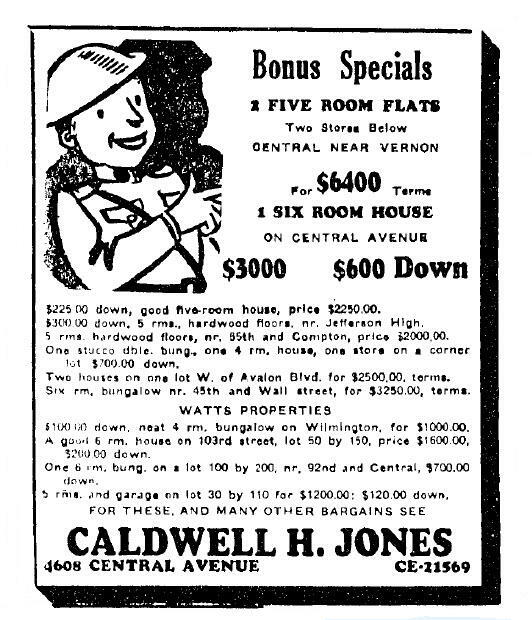 By 1940, Jones and his wife were divorced, and he was living in a rented house on East Jefferson Boulevard, a few blocks north of the church. 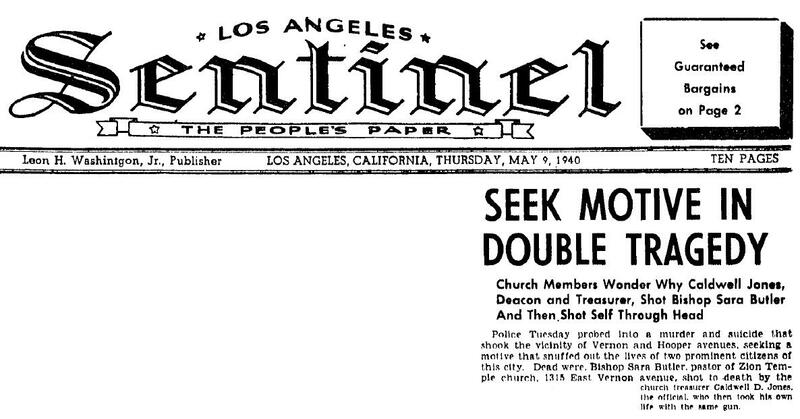 On the afternoon of Tuesday, May 7, 1940, Jones went to visit Bishop Sara at the church. 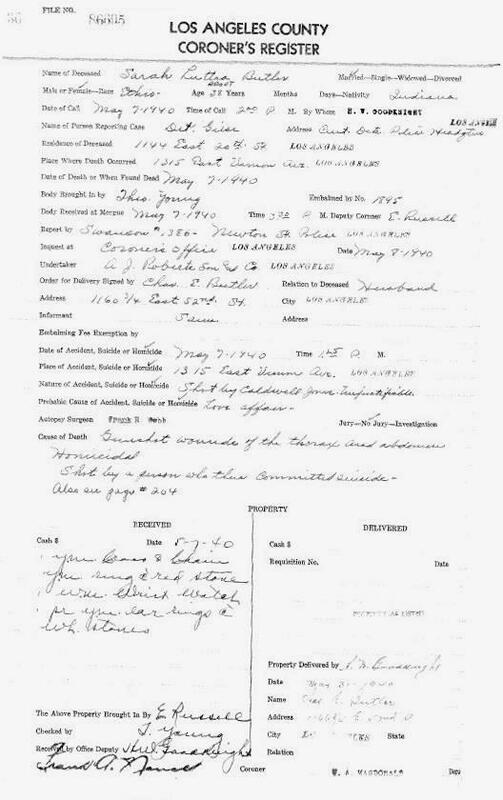 They went to her upstairs apartment at the church parsonage, where Jones pulled out a handgun -- a .32-caliber Colt automatic. He shot Butler three times, then shot himself once in the head. The church caretaker, Horace Nesby, was outside planting flowers when he heard four shots coming from the upstairs study at the parsonage, and called police. When police arrived, all the doors were locked from the inside. After breaking in, they found both Jones and Butler dead. According to the description of the scene in the Los Angeles Sentinal, "The room indicated that the pair had quarreled and perhaps indulged in some sort of scuffle." Butler's body was found just inside the door to the living room leading to a small kitchenette. She had a bullet wound to the left front temple, which exited in the back of her head, on the right side, at the base of her skull. "After taking the comely church leader's life," according to the Sentinal, Jones "employed a mirror which he tilted at an angle in order to better aim the lethel weapon at a vital spot in his skull. The lone shot entered the right temple, emerging at the top of his head. He fell from the chair in which he had been seated, face forward on the floor." The Sentinal also reported that, "Jones, the treasurer of the church, was known to have been deeply enamored of the comely church leader." Both Butler and Jones were described as prominent citizens and active in the community. Almost immediately, the eight members of the church's Board of Directors issued a statement that Jones was "of unsound mind" and "one who several months ago had been pronounced a mental case," and had that statement published in all of the black newspapers in the area. The church board said it had asked for Jones' resignation, "and our only regret is the pity of this tragedy from one who was unbalanced and knew not what he did." The unofficial and rapidly spreading theory, however, was that Jones and Butler may have had a relationship that went beyond church business, or that he pursued her and she spurned his advances. The church board's quick statement that the murder-suicide was simply the tragic action of a deranged man raised more questions than it answered. Other than a brief mention in the L.A. Times, there was almost no coverage of the shooting in the mainstream Los Angeles media. 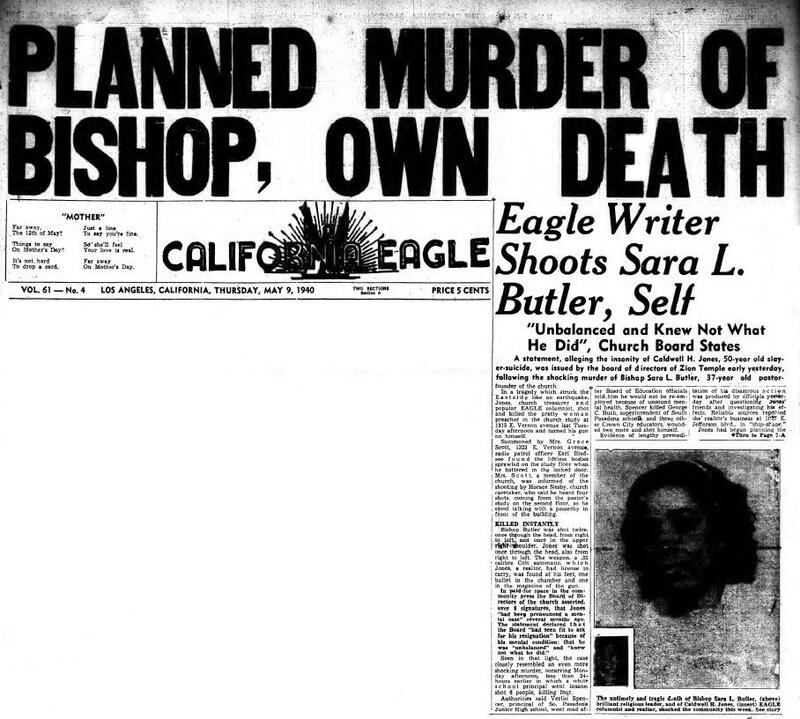 Among black newspapers, however, particularly the Los Angeles Sentinal and the California Eagle, where Jones worked as a columnist, the shooting was front-page news. There is no known coroner's inquest investigation or report on the deaths. There is, however, an official Los Angeles County Coroner’s Register, which lists the basic details of the case when a body is received. For both bodies, on the line that asks, "Probable cause of accident, suicide or homicide," the answer is "love affair." It will probably never be known what the exact relationship was between the bishop and the church treasurer, or exactly what transpired behind those locked doors, other than the tragic conclusion. Butler's funeral service was held at her Zion Temple Community Church, and attracted an estimated 7,000 mourners. The service was scheduled to start at 10 a.m., and mourners started to show up at the church at 6:30 a.m. By the time the service started, the church was filled, and hundreds of mourners were gathered outside the church, spilling across the lawns of the neighboring houses. In contrast, Jones' funeral service was private, held at the People's Funeral Home in Los Angeles. Both, however, were buried in Evergreen Cemetery -– Butler beneath a large cross, identifying her as "Bishop Sara L. Butler, Founder of Zion Temple," while Jones’ grave is unmarked. After his wife's death, Charles Butler lived quietly until Nov. 21, 1951, when his landlady found him slumped in his chair, an open Bible in his lap. He was 68 years old, and it was assumed that he died quietly while reading. Butler's Bible was open to the 88th Psalm, which is generally regarded as the most mournful and melancholy of the psalms. The writer is in bitter distress, abandoned by his friends and family, and waiting to die. He cries out to God, seeking help and comfort, but receives no reply. When Charles Butler died, none of his relatives could be found. His funeral service was held at the Angelus Funeral Home, and was conducted by St. James Masonic Lodge. He was buried at Evergreen Cemetery, far from his wife, and his grave is also unmarked. Bishop Butler's Zion Temple Community Church is still around, at the same location. In 2014, the congregation celebrated the church's 80th anniversary. Special thanks to Lisa Albanese and Craig Harvey for their kind assistance with this story.